WEDNESDAY, Jan. 10, 2018 (HealthDay News) — Mirror, mirror on the wall, who’s the brightest mammal of them all? Using mirror images, researchers found that bottlenose dolphins show signs of self-awareness earlier in life than humans and chimpanzees. Recognizing oneself in a mirror is an indicator of self-awareness. This capacity has been identified only in humans, dolphins, great apes, elephants and magpies, the researchers said in background notes. Studying two young dolphins at the National Aquarium in Baltimore, the investigators assessed how the dolphins interacted with their image in a mirror. 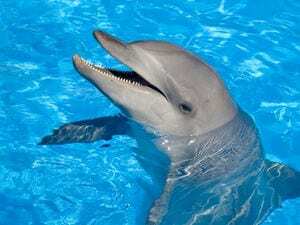 One dolphin first showed self-directed behavior indicative of mirror self-recognition at 7 months of age, said one of the study authors, Diana Reiss. She’s with Hunter College of the City University of New York. Humans first show self-directed behavior at a mirror between 12 and 15 months of age. This firms up between 18 and 24 months of age. Chimps have exhibited these behaviors at a later age, the researchers noted. The findings “add new layers to our understanding of factors that may contribute to the capacity for [mirror self-recognition] across species and the evolution of intelligence in the animal world,” Reiss said in a Hunter College news release. Research has shown that the emergence of mirror self-recognition in children is tied in with sensory and motor development and growing social and self-awareness, the researchers said. “The early emergence of this level of self-awareness coincides with the dolphins’ precocious development of social awareness and advanced sensorimotor skills,” said study co-author Rachel Morrison. She’s from the University of North Carolina at Pembroke. The study was published online Jan. 10 in the journal PLOS ONE. The U.S. Centers for Disease Control and Prevention has more on child development.